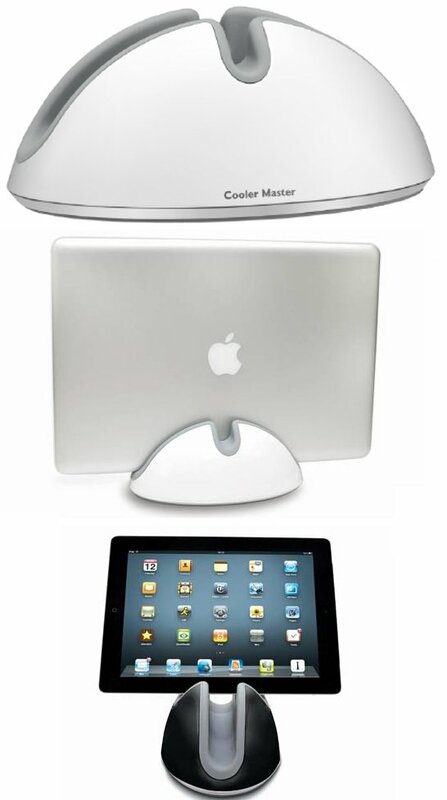 Cooler Master introduces the ARC, a new stand designed for Apple's iPad and MacBook Pro. The MSRP of Cooler Master's Arc is $59.99. Cooler Master, an industry leading chassis, thermal solution, peripheral, and accessory manufacturer today announces a visually alluring new piece of functional art, the ARC MacBook Pro and iPad stand. Draw attention to your beautiful pieces of technology with this new multipurpose stand. Wish a fond farewell to clutter while significantly reducing the space that your MacBook Pro or iPad normally uses by laying in their normal flat position. Elevate your MacBook Pro by placing it in the ARC stand and know that it will stay snug and safe in its place with its anti-slip rubber grips. Simply place your iPad in the specialized iPad slot and use it to view recipes, instructions, watch a video, as a digital easel, or any of the myriad other uses available to you while docked. When it is time to get down to work or play, place your Macbook Pro in the slot and it instantly transforms into a virtual slim desktop. Greatly increase comfort while using your MacBook Pro or iPad for extended periods of time by placing it in the stand and using an external display, keyboard, mouse, and other peripherals. ARC MacBook Pro and iPad stand releases on April 24th, 2012 exclusively through Apple.com. Price and availability will vary based on region. This information is intended for the U.S. and Canada regions only.